↑ Toplin, Robert B. History by Hollywood: The Use and Abuse of the American Past (Urbana, IL: University of Illinois, 1996.) আইএসবিএন ০-২৫২-০৬৫৩৬-০. Barrow, Blanche Caldwell and John Neal Phillips. My Life with Bonnie and Clyde. (Norman: University of Oklahoma Press, 2004.) আইএসবিএন ৯৭৮-০-৮০৬১-৩৭১৫-৫. Burrough, Bryan. Public Enemies. (New York: The Penguin Press, 2004.) আইএসবিএন ১-৫৯৪২০-০২১-১. Guinn, Jeff. Go Down Together: The True, Untold Story of Bonnie and Clyde. (New York: Simon & Schuster, 2009.) আইএসবিএন ১-৪১৬৫-৫৭০৬-৭. Knight, James R. and Jonathan Davis. Bonnie and Clyde: A Twenty-First-Century Update. (Austin, TX: Eakin Press, 2003.) আইএসবিএন ১-৫৭১৬৮-৭৯৪-৭. Milner, E.R. The Lives and Times of Bonnie and Clyde (Carbondale and Edwardsville: Southern Illinois University Press, 1996.) আইএসবিএন ০-৮০৯৩-২৫৫২-৭. Parker, Emma Krause, Nell Barrow Cowan and Jan I. Fortune. The True Story of Bonnie and Clyde. (New York: New American Library, 1968.) আইএসবিএন ০-৮৪৮৮-২১৫৪-৮. Originally published in 1934 as Fugitives. Phillips, John Neal. Running with Bonnie and Clyde, the Ten Fast Years of Ralph Fults. (Norman: University of Oklahoma Press, 1996, 2002) আইএসবিএন ০-৮০৬১-৩৪২৯-১. Ramsey, Winston G., ed. On The Trail of Bonnie and Clyde. (London: After The Battle Books, 2003). আইএসবিএন ১-৮৭০০৬৭-৫১-৭. Steele, Phillip, and Marie Barrow Scoma. 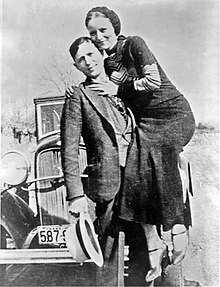 The Family Story of Bonnie and Clyde. (Gretna, LA: Pelican Publishing Company, 2000.) আইএসবিএন ১-৫৬৫৫৪-৭৫৬-X. Treherne, John. The Strange History of Bonnie and Clyde. (New York: Stein and Day, 1984.) আইএসবিএন ০-৮১৫৪-১১০৬-৫. Webb, Walter Prescott. The Texas Rangers: A Century of Frontier Defense. (Austin: University of Texas Press, 1935.) আইএসবিএন ০-২৯২-৭৮১১০-৫.